Pea Pickle Farm: one. two. three. four. then a bit more. i know, you know, we all know. direction. trees. god. mock turtle soup. one. two. three. four. then a bit more. i know, you know, we all know. direction. trees. god. mock turtle soup. Somewhere along the way Deb was reminded of a story her neighbor tells of two famous writers who one night slid off the road in front of her house. They were drunk. Maybe also it was snowy and icy. Anyway, they ended up staying the night. Deb couldn’t remember names, but did offer a clue: Nationally famous, of the Upper Peninsula, writing about the Upper Peninsula. Jim Harrison? No, no. You know … Oh, yeah, yeah, I know. That guy. Robert Traver, or Travers, no, I think Traver—yeah, that’s him—but Traver’s the pen name. What was his real name? Gosh, darn … I know, I know, we know, and it’s like right there but invisible. The next day, at home, “John Voelker” popped into my head, a bright pinhole of light through all that grey matter. You know what that is like, right? You can’t think of it, can’t think of it, you know it, ah forget it, it’ll come to me later, and then, later, sure enough, there it is. The elevated train ride from Morse Avenue to Wrigley Field is about seven stops long. What I see in my head is Thorndale, Granville, Loyola, Lawrence, Wilson, Sheridan, Addison. This is just a piece of the Red Line, north to south. Last week Deb and I were making this trip and as we click-clacked southward we stood near the train’s doors looking at a map of the Red Line above the doors, a very clear, simple map, except it was backwards. At the far left was the last stop at the south end of the line. On the far right was Howard, the last stop at the north end of the line. The way we were headed, it looked as if we were heading toward Howard, in other words, going north instead of south, which would mean we were going the wrong way. Deb asked me a few times during our el travels if we were going the right way. I always knew we were. But traveling south while trying to follow along on a map which has its north end on the south end—well, that is confusing and somewhat disconcerting. We figured it was an optical illusion, but I still can’t quite figure out why the map was like that, unless the train was traveling backwards, which kind of makes my brain stop like a truck jackknifing. 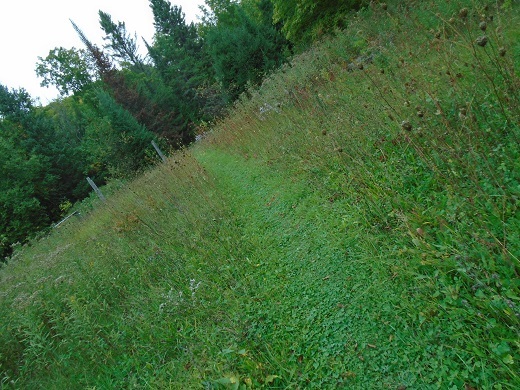 And for some reason right now it reminds me of when I was first in the U.P. driving down some two-track dirt road that, starting out, seemed to be going somewhere because, after all, here is a road, or at least a semblance of a road, and maybe even this road is on a map, but give it ten or twenty minutes going down this road and that so-called road has me in a vague panic because by then I am sure this road is going nowhere and going so very slowly to boot. I transplanted a tree. Dug up a quaking aspen from the field just south of the yard and put it in front of the cabin, in the hole left by the old fire pit, having dug out the rusting remains of the steel barrel that had been sunk there into the earth about a foot or so. The yard looks better now with this tree, but I will have to think of a new place to burn stuff. This is near where I once planted two apple trees, both of which have died, though there is a little greenery coming up from the base of each. Two people have told me oh, those apple trees are coming back. I think well, maybe. 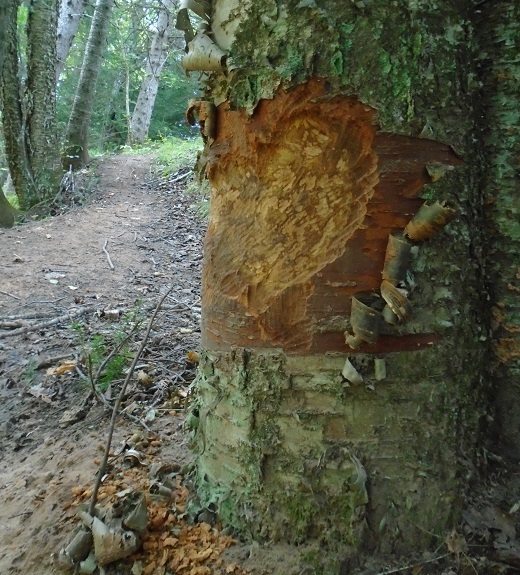 The aspen is about eight feet tall but was not hard to dig up. Less than a foot down into the earth two good-sized roots went this way and that way, east and west, like a T intersection. I thought maybe this is why the tree quakes, it has such shallow roots. But I had to cut through both roots to free the tree. If this kills it, I will be guilty. If not, and the tree takes hold in its new spot, roots now burrowing north and south, I will be rewarded with a lovely shade that dances in summer, quakes in autumn, disappears in winter. What spring brings, we’ll have to wait and see. There are various way of changing direction. Someone is gnawing the trees along the river, stripping off ribbons of bark near the base, leaving the ribbons on the ground. 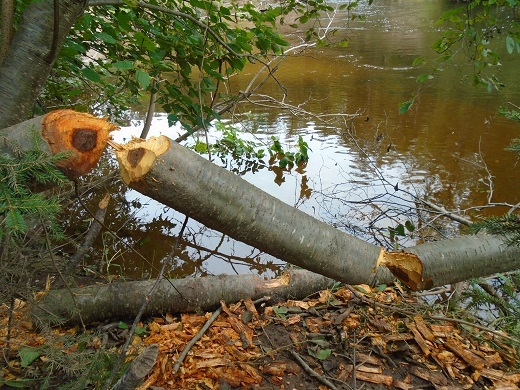 Perhaps it is the beaver who has felled a couple of trees down near the bend in the river, leaving the trees lying there, and I wonder why. Why gnaw down a tree and then leave it lying there? Why not drag it to the dam site? 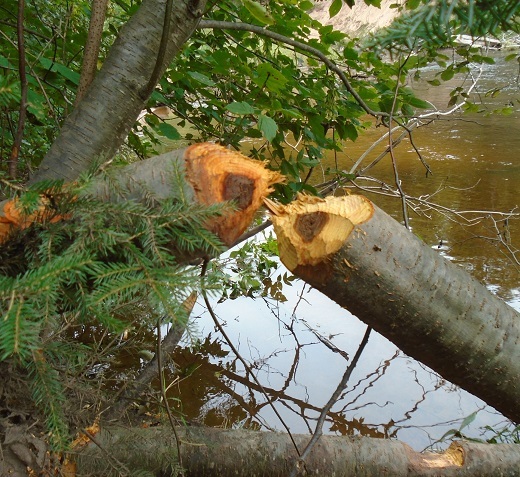 Possible answers: Oh, that tree was too big anyway; or, maybe it was a young beaver, just practicing; or, maybe it was an old beaver, felled a tree then couldn’t remember why; or, maybe the wood needs to dry before hauling and damming; or, none of the above; or, maybe this is the Future Site of Beaver Dam Deluxe, Apartments Available. Please visit our website, DamDeluxe.com. One afternoon it is warm but not too warm, early fall, afternoon sun, a light northeasterly breeze rustling green leaves yet on the trees though a few now brown, a few now dry, a few now red or yellow, slightly curled, letting go. Walking through the field all sunshine, a few pesky flies. Down the shaded bank to the river no flies, river flowing gentle tea brown, copper, dappled sparks. Above, leaves move, sway, murmur, and I think there is God. I hear some thinking I am saying God is in nature; perhaps that is right. I hear others thinking I am saying that nature is God; but that would be wrong. And Josie, I imagine, is saying: You mean those squirrels up there? They’re gods? What are you, nuts? And Elliott has followed us but truly, he pays no attention. Today I am hoping a melody, some lyrics, and the title of a song will pop into my head. In the lyrics is something about mock turtle soup. It might be a Cole Porter song, and Frank Sinatra may be one of the many who sang it. Then I give in, google “mock turtle soup cole porter,” and there will be no bright light through grey matter, just this song to close with.